This application note describes how laser-based headspace analysis is used for the rapid non-destructive determination of headspace oxygen levels in pre-filled syringes. Data is presented demonstrating two major applications of this technique: 1) headspace oxygen monitoring on a pre-filled syringe line filling oxygen-sensitive product, and 2) container closure testing of pre-filled syringes. The inspection of headspace oxygen in syringes having a purged nitrogen headspace can also be used to determine whether the container closure integrity of the syringe has been maintained. A pre-filled syringe that has suffered from a container closure integrity failure will immediately begin to diffuse air into the headspace. This ingress of air results in headspace oxygen levels that are elevated compared to syringes that have maintained closure integrity. Defective syringes with high levels of headspace oxygen can then be detected and removed in an inspection process. This Application Note describes how laserbased headspace analysis is used for the rapid non-destructive determination of headspace oxygen levels in pre-filled syringes. 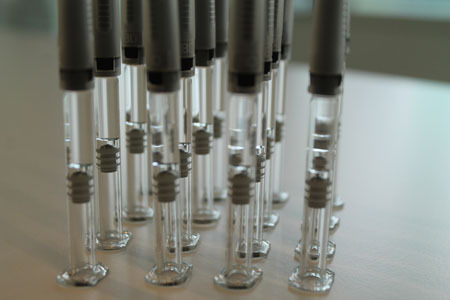 Data is presented demonstrating two major applications of this technique: 1) headspace oxygen monitoring on a pre-filled syringe line filling oxygen-sensitive product, and 2) container closure testing of pre-filled syringes.